I wrote a bit about Super Why! back in this post - if you would like to know a little more about the show. First off, Happy Halloween to everyone! So, for Halloween, coming up with a costume idea for the baby was easy. Buy a bumblebee bunting costume from Target for less than $15. Have the baby wear it long enough for others to go "ooh" and "aww" because baby can't wear it in her car seat. Then have the baby wear a cute "My 1st Halloween" sleeper for the remainder of the day. For a very picky toddler, we have a completely different story. As you may already know, Tristan loves elephants. So, I was going to make him an elephant costume. First, I bought a full body mouse costume (couldn't find an elephant one). I was going to augment the ears, modify the tail, make an elephant trunk, and add tusks. When we tried having Tristan wear the costume (no modifications yet), he wouldn't have it. He threw a fit. So, I had three choices: a) go with the plan, he loves it, he wears it, success! b) go with the plan, he still doesn't want to wear it, disaster, or c) go with something else - something that looks more like, well, real clothes. I went for option c. This is where Super Why! comes into action. 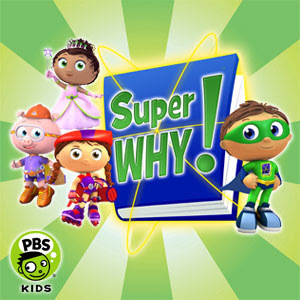 Looking at the picture above, Super Why, the character of the show, is the kid in the green and blue. Honestly, it looked really simple. Blue cape, blue undershirt, green shirt with logo, green pants, blue underwear over pants, and mask. Tristan loves the show and he knows who Super Why is. So, after finding out that my sewing machine wasn't going to work for me, my mother-in-law and I put this outfit together by hand. It would have looked even nicer had the sewing machine been cooperative, but I think it turned out okay. I used Paint Shop Pro to edit the logo image for the front of his shirt. We then printed it on an iron-on transfer sheet. Kate (my MIL) and I actually had fun with the costume. I couldn't find green pants anywhere. I basically gave up and said he was just going to wear jeans. But then Scott had a brilliant idea. The green shirt I bought to go over the blue one was long sleeve. When I mentioned to Scott my plan to cut the sleeves so that it is a short sleeve shirt, he said that the leftover arms might be usable as pant legs. Though the fit was a bit snug on his legs, it was actually almost the perfect length. So, Kate sewed the "legs" to the insides of blue shorts, while I worked on finishing up the edges of the arms. We then worked on the cape. Because I had to feed the baby, Kate sewed the cape to the inside of the shirt. The belt, I made out of yellow fabric, iron-on velcro, hot glue, and a play-doh lid (for the circle emblem on the front of the belt). I made Tristan a green mask, but he didn't want to wear it. This morning, Tristan really didn't like the costume - at all. He didn't like the mask. He didn't like the cape. We kept telling him that we're going to get candy, but he had to wear his costume. We got out the house with some protest, but when we got to the senior home to meet up with the mommy groups (there were three mommy groups there, all with little one's all dressed up), Tristan forgot about his cape and costume. I think he likes to fit in - so, when he saw other kids dressed up, he felt right at home. He had a bunch of fun trick-or-treating at the senior home. Afterwords, we went to my work to visit. My boss had fun taking Tristan around the office to get some treats. Tristan loved every minute of it. Meanwhile, the baby got passed around the office giving the women their "baby-fix". After lunchtime, we headed to the mall with our friends to do some trick-or-treating. We split up - mainly because Tristan wanted to do his own thing (he didn't want the candy, he wanted to play on the indoor playground). Even though, we really didn't get to hang out with our friends, it was still fun. Tristan got some candy, he played on the playground, and then we got him a turtle (see pictures below). Overall, we had a busy Halloween. By the time, we got home, it was dinnertime already. After dinner, and feeding the baby, I fell asleep holding her. My little nap is giving me enough energy to get through this post, finish up a few things, before I completely crash for the night. I hope your Halloween was a fun and safe one! Ours was definitely fun and safe. I can't wait until next year's Halloween. Melayna might be walking (Tristan was a late walker, so it is hard to tell how she'll be). Tristan might be more cooperative with getting dressed up. And we might make it to my work's children's Halloween party (this year's was really early - the weekend after Melayna was born). Well, here's some pictures of the kids. I'll get some better ones of Melayna in her bumblebee costume later. He looks guilty. I wonder what he's up to. By the way, when I said that the leftover arms were almost the perfect length, you can see why in this photo. If they were just a tad longer, you wouldn't be able to see his socks. But alas, we had to make do with what we had. Here's a good front view of the emblem on the shirt. And here is his newest furry friend, Patch. We've been reading the same bedtime story for almost a month. It is called "Patch's Lucky Star". It is a short and simple tail, but Tristan loves it. So, instead of adding to his pachyderm collection, we convinced him to make a turtle (we were at Build-A-Bear). The store attendant asked Tristan what he wanted to name it, but he couldn't think of anything. That is when I suggested Patch. sometimes we have to help them out a little!! I love your little Halloween babes!